Your time is important, and there's never enough of it. As you become more proficient and knowledgeable as a professional, it's important to continually raise the personal productivity bar for yourself. Your career and your overall sense of satisfaction depend on your ability to become more efficient and effective in the skill of time management. Of course, in reality you can't manage time. It is what it is, and the clock simply ticks off the seconds, minutes and hours while you do what you do. In reality, time management is self management. Your old time management habits are your greatest obstacle to achieving higher levels of personal productivity. In essence, time management is about personal change. "If you always do what you always did, you'll always get what you always got." As important as it is for you to continually improve your personal productivity, it's even more important to continually raise the productivity of your team. You can jumpstart the process today by scheduling a time management workshop for your team. Our workshops are developed and conducted by professional speaker, trainer and productivity coach, Roger Reece, and they provide you with a means of showing your team that you're serious about productivity. It starts with an email or a phone call. Contact us and we will send you an email with information about fees, availability and options for customizing the workshop to fit the needs of your team. If, after receiving the information, you are interested in taking the next step, let us know and Roger Reece will contact you to schedule a phone call to discuss your team's time management needs. After the phone call, you will receive a detailed outline of the customized time management workshop we recommend. 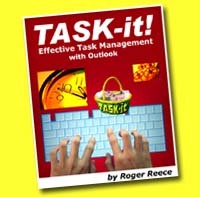 Roger Reece's new book, TASK-it: Effective Task Management with Outlook will take you to the next level of time management effectiveness. If you are using Outlook 2007 or 2003, you don't need to upgrade to Outlook 2010 to take advantage of TASK-it. The ebook is available in three versions, covering all three versions of Outlook. This 75-page downloadable eBook is available exclusively on this website. Click this link to Find out more about the book. In your time management workshop you'll learn how to overcome the habit of procrastination. However, if it keeps you from contacting us, that workshop will never happen. Contact us now to get the ball rolling!